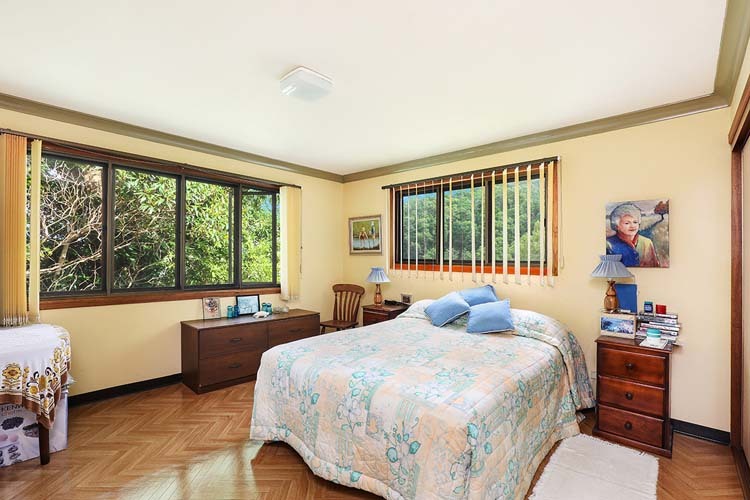 The owners bought this property in 1988 and constructed the home in 1990. Since then, they have transformed this 4.86 hectare (12 acres) property into a beautiful rural retreat offering privacy, space and tranquillity with coastal views. The well maintained, lush setting will impress all who inspect. One of the features that’s often overlooked, is the very liveable climate the property location offers. Due to its elevation and protection from the prevailing winds the property although located in a sub-tropical zone, offers almost a temperate climate. A climate that offers comfortable living all year round. As soon as you drive through the gate you get a sense of what this property offers. 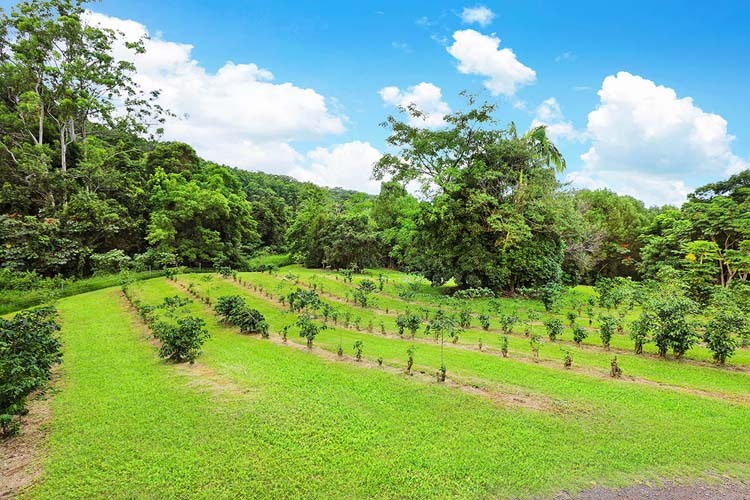 The mainly bitumen driveway meanders through the property past the coffee and tea plantation, over the wooden bridge with its idyllic rainforest setting up to the home. The federation style home is solid and in good condition. The home offers 4 large bedrooms with built-ins, office, ensuite and main bathroom. The well-appointed kitchen has a family room adjacent, separate dining area and spacious lounge. The laundry is large enough to accommodate a sewing/craft area. There are two verandas, both fully screened. 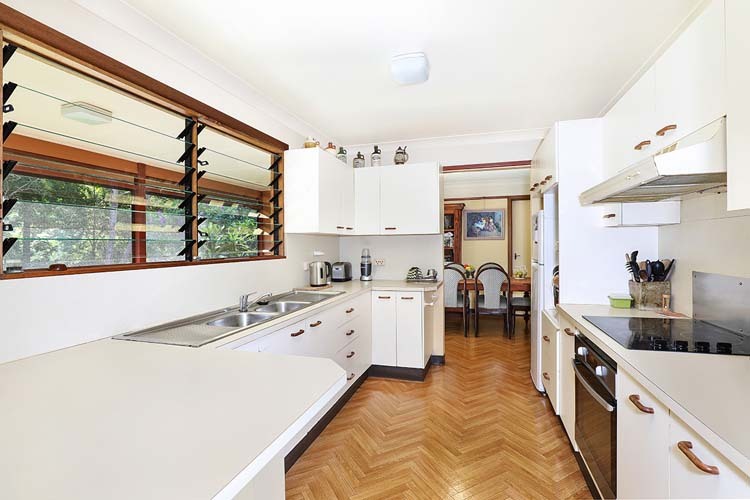 The front veranda could offer fantastic views down to Caloundra and the Sunshine Coast. All that needs to be done is to fell or prune some of the trees that have grown up over the years. The rear veranda is an ideal place to have morning and afternoon teas, overlooking the beautiful sub-tropical garden. Vehicles are housed in the double carport adjacent to the house. For comfort, there is an air conditioner in the lounge and another in the family room while the solar water heater will help to keep your electricity bills low. The farm machinery is housed in the 12m x 9m Colorbond shed that has an attached skillion roof awning for extra storage. The shed has two high clearance doors, concrete floor, good lighting and power. The horticultural variety the property offers is most exciting. There is a “vanillery” – a vanilla vine plantation which is fully established in the 10m x 20m hot house. The vines have an automatic watering system and consist of approximately 80 metres of trellising. Harvest time is November with the beans selling for around $300 per kilo. There is another 11m x 7m hot house where the owners had planned on expanding the operation further. The coffee plantation consists of 470 plants and will produce from 1,100 to 1,800 kilos of coffee per year. The beans are well sought after and sold to one of the coasts well known coffee companies. The tea plantation is only small and consists of 60 trees. In the past the owners have sold the tea leaf at the markets for around $6 per 30 grams. The fruit trees are well established and consist of Mango, Avocado, Macadamia, Jaboticaba (Brazilian Grape), Pecan Nut, Strawberry Guava, Pineapple Guava, Chinese Raisin Tree, Jamaican Chestnut and Star Fruit. There are three goats on the property who are enjoying beautiful views down to Caloundra from their paddock adjacent to the house. For the equine lover there is ample room to have the family horses accommodated on the property. Water for the property is obtained from 8 x 5,000 gallon tanks – a total of 180,000 litres. There are 4 tanks connected to the house, two connected to the shed and two connected to the hot house. Each location has its own pressure pump. The entire property is flood free and in 30 years the property has never been cut off due to heavy rain. Landsborough township is only 4 kilometres away or a 7 minute drive while Caloundra is a 26 minute drive and Maroochydore CBD 37 minutes. 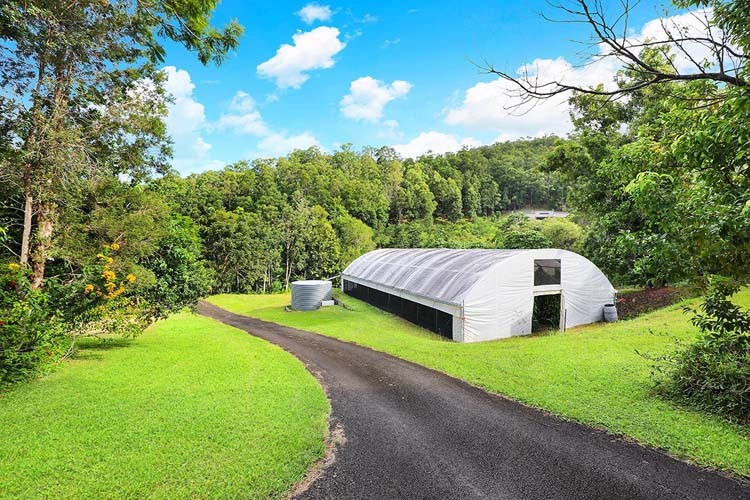 The farm is a testament to the hard work the owners have put into the property over the years, however it is now time for the owner to move on into retirement. If you are looking for your own slice of rural paradise then this property should definitely be on your list to inspect. Inspect this property and I am sure you won’t be disappointed.